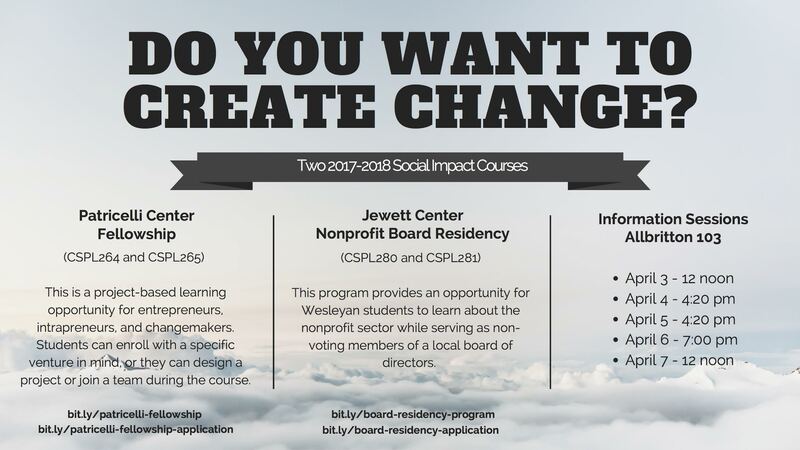 The Jewett Center Board Residency Program provides an opportunity for Wesleyan students to learn about the nonprofit sector while serving as non-voting members of a local board of directors. In addition to a weekly lecture on campus, residents will attend board meetings, actively participate in board committees, and complete board-level projects. Application here! The Patricelli Center Fellowship is a year-long, project-based learning opportunity for entrepreneurs, intrapreneurs, and changemakers. They are seeking highly-dedicated students who wish to take a deep dive into social impact work. Students can enroll with a specific venture in mind, or they can design a project or join a team after the course begins. Application here! There will be FIVE information sessions, all in Allbritton 103, to learn more about these two courses from the respective instructors, Cathy Lechowicz and Makaela Kingsley. Come with questions! Posted by wilk in General on April 4, 2017 at 12:49 PM.